Infiniti, the luxury performance automotive brand from Nissan, has unveiled the Limited Edition BR02-8 Infiniti Carbon Case Purple 8 Pro Dial wristwatch (that will take a while to remember, won’t it? 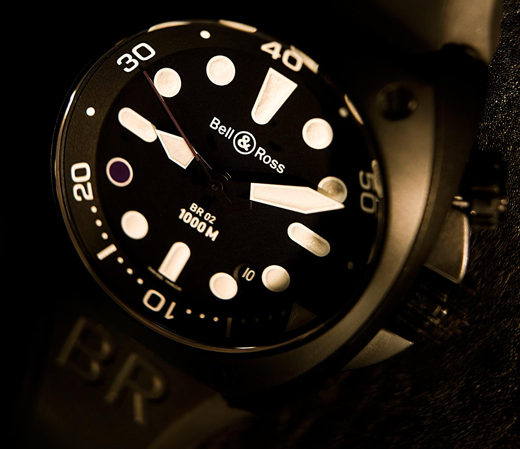 ), engineered by the Swiss specialist timekeeper specialist Bell & Ross. The elegant watch has been designed to celebrate the collaboration between Infiniti and Bell & Ross. According to the official statement, only 200 examples from the BR02-8 Infiniti Carbon Case Purple 8 Pro Dial series are available for purchase from any of the Infiniti Centre worldwide including the 45 outlets across Europe. The timepiece is sporty but subtle, with the seconds pointer and eighth digit which sitting on a matt black dial, sport a photo-luminescent finish in the same distinct purple colourused by the automaker Infiniti across the world. The number ‘eight’ is a symbol of luck in Asia, whilst also resembling the mathematical sign of infinity and the automaker’s badge when rotated on its side – a fitting symbol, given the automaker’s name. As a reminder of just how special this watch is, the steel case back has been beautifully engraved with the Infiniti signature, discretely complementing the Bell & Ross insignia. “The Limited Edition BR02-8 Infiniti Carbon Case Purple 8 Pro Dial wristwatch is a true celebration of our continued association with Bell & Ross, for which we are very proud. The new timepiece effortlessly embodies the unique qualities of both brands to offer discerning customers a rare and highly sought-after addition to their collection,” explains Andy Palmer, Infiniti’s Executive Vice President. This entry was posted in Watch, wrist watch. Bookmark the permalink.